You will not be considered as a champagne enthusiast until your guests see champagne saber from your living room or in the office. This majestic sword can be traced back from the time of the great Napoleon Bonaparte. We all know that such sword is intended for thrusting, but these days, you can use this saber for sabering or sabrage. Probably you’ve witnessed such an art several times when you are eating on a fancy restaurant or probably an occasion to celebrate. 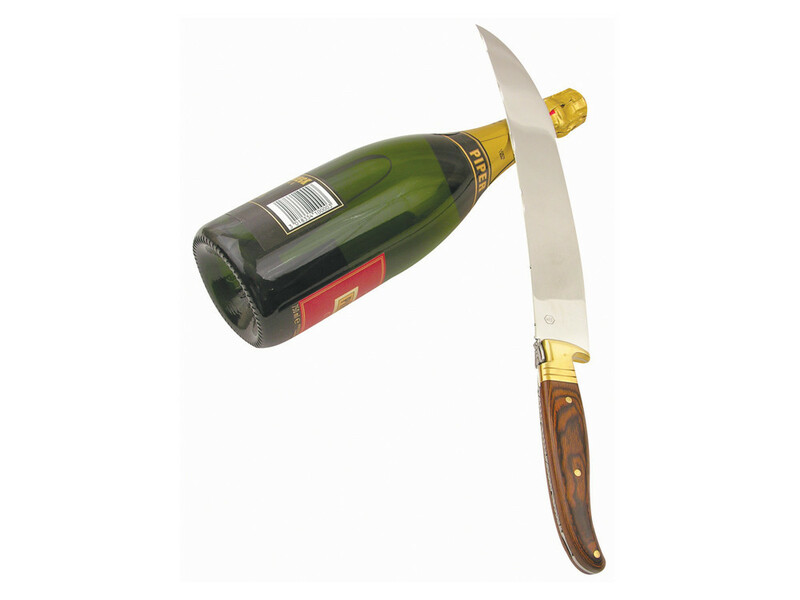 You don’t need however to be a professional bartender or chef to have champagne saber. In fact, even if you know how to execute sabrage, you can buy this stuff and be your personal collection at home. There are wide arrays of champagne swords to choose from created from the finest manufacturers in the world. Having this at your home can be very satisfying where you can boast to your friends, visitors, and loved ones. This simple yet, elegant saber can be very fulfilling. Just imagine this antique champagne sword displayed inside your home or probably at the office. The sword is indeed the highlight reel of the place where anyone would stare at it and ask where did you get this elegant sword? You can put this elsewhere even if you have kids at home. You don’t need to worry such a thing since the saber has no sharp edges that can injure and harm someone. If you look closer, the champagne saber’s blade is blunt. This is because when executing the art, it does not require sharp edges to do so. The secret behind sabrage is what’s happening inside the bottle. Is a high-quality piece of an art made from the finest swordsmiths in the little town of Maniago Italy. This is a town which is recognized by many as the finest maker and production of knives, swords, and blades. It is a luxurious Italian saber Icon with its majestic polished blade quality. You can simply put this on your office table and wait until someone sees’s it. As the name it implies, the handle is made from authentic Buffalo horn. This cool with the attitude black saber is a fine collection which can be very satisfying as you stare at it inside your home. You can put this on your chimney or probably somewhere which this magnificent sword will be highlighted. This quality saber is not just good when it is displayed but also one of the best tools when it comes to sabering. The blade will be delivered to you with its wooden box and wooden stand. Crafted from the small town of Maniago. This silver champagne sword has a robust perfection of authentic antique saber design. Its handle is made from deer horn with a unique style. You can never go wrong with this one whether you are going to use this as display or champagne sabering. Tagged champagne saber, champagne sword. When you place an order, it will be shipped within 24 hours, even with engraving (Monday-Friday, excluding holidays). When your order has been shipped delivery time is 2-3 working days. All orders are delivered by UPS. Free shipping! © 2019 Champagne Sabers. All prices in USD. Designed by Empyre. Powered by Shopify.